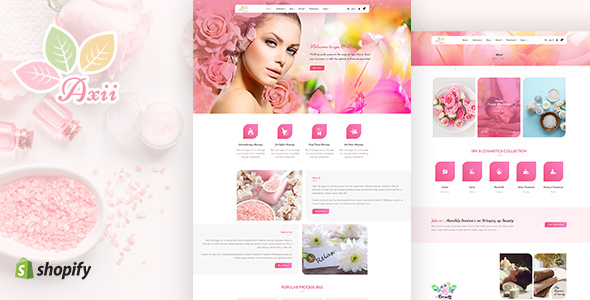 Axii is a bewitching and fascinating Shopify theme designed to promote and sell spa, salon, makeup, cosmetics, and all beauty related products. The theme is easy to use and mobile friendly Shopify theme is created in accordance with the modern trends in the web design. Its eye-catchy animation effects and color mixture will dazzle the visitors at first sight. One of the outstanding features of Axii is its simple but clean and creative layout with bright and beautiful images which highlight your goods and services in a prominent look. The theme has all the required tools and modules to create a superspeed and SEO friendly website with amazing UX. In addition, a great variety of diverse layouts and styles allows creating unique structures that satisfy any of your specific requirements in seconds to your target audience. Scroll the mouse down, you can see many more wonderful features of Axii.